I left my headphones at home so, on my way in today, thought I’d pop into Poundland and grab a cheap pair to tide me over. Poundland pretend that the stuff they sell is of a good quality and, in turn, assume that their customers are idiots. Nice try, Poundland. Not me. I was determined to get the biggest bang for my single buck in the name of New Moons. They had a few models to choose from: “earphones”, “sport” and “super bass”. Further technical information was scant, so I resorted to trying to work out which set made most efficient use of their paltry manufacturing price, thus delivering the ultimate aural experience. Given their abundance on the shelf, I guessed that the “earphones” model had the largest markup. Or, perhaps they turned out to be so blisteringly good that the manager of Camden Poundland ordered in three pallets worth. Assuming the former, I passed. “Sport” looked exactly the same, only they came with a convenient carry pouch. While a lovely idea, that’s half a pence or so borrowed from the audio component budget. Pass. The “super bass” model from renowned hifi specialists Signalex were in shortest supply and the packaging made the loftiest claim of all. There were no gimmicks to speak of, either, so I decided they may be the best choice. Admittedly, the consumer fascination with accentuated muddy lows does get on my wick. Fortunately, when I got to the office and plugged them in I found a complete lack of bass response altogether. In fact, they seem to resonate at a particular frequency and not much more, like a bottle in the wind. I am wracked with consumer guilt. They’re heading straight into the sea and I’m very sorry. Luckily I had already selected my track of the day last night. 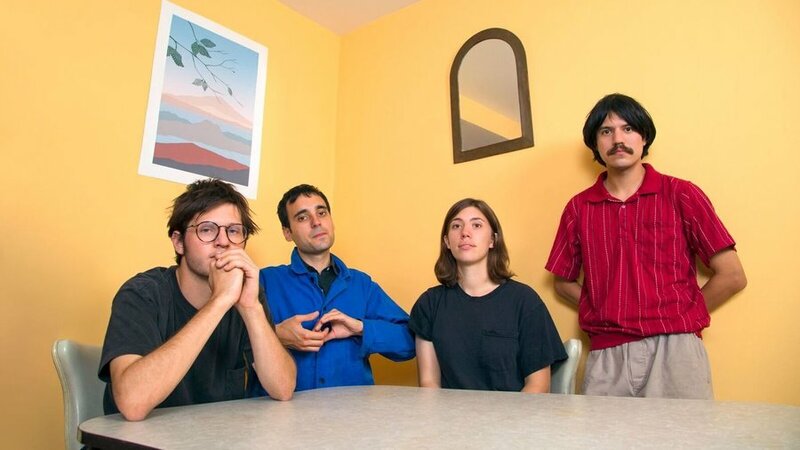 Dog Milk is taken from Palm‘s upcoming LP Rock Island, and it’s evidently a labour of love from the Philadelphia four-piece with infinite attention to detail from all four corners of the band.